June'syounghats provide a unique designed new look for ladies with Surrounding beautiful decorations:polyester fibre. ect. Fresh adding in the summer and warming keeping in the winter. Elegance and royalty added to you for all seasons. Interior adjustable draw string, will accommodate 55cm - 58cm. Perfect for wearing a fancy event, Outdoor tea, Kentucky Derby, Grand National, Melbourne cup, wedding, church or eligious gatherings. Great for ladies, and teens and girls. 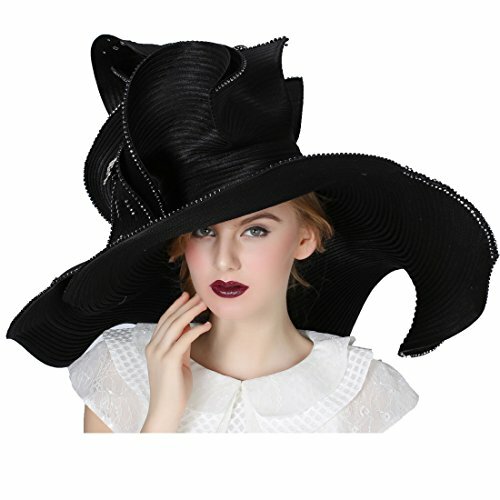 About Us: Koola's younghats store is an online retailer of excellent handmade hats for women, including church hats, sinamay hats, felt hats, organza hats, straw hats, velvet hats and fascinators, which has been all made and designed by ourselves. We have served all our merchants with good quality and guarantee for after-sale service, and always receive good feedback. Please feel free to contact us for any interest! Thanks. Wear to Church, Fancy Parties or Gatsby Picnics Warming keeping in the Late Autumn. Elegance and royalty,Great for outdoor activities.added to you for all seasons.with big wide brim. If you have any questions about this product by Koola, contact us by completing and submitting the form below. If you are looking for a specif part number, please include it with your message.